THE Research Excellence Summit: Eurasia 2018 was held on 29-31 August 2018 in Kazan. On the framework of the Summit was announced the first totals of rating THE (Times Higher Education). 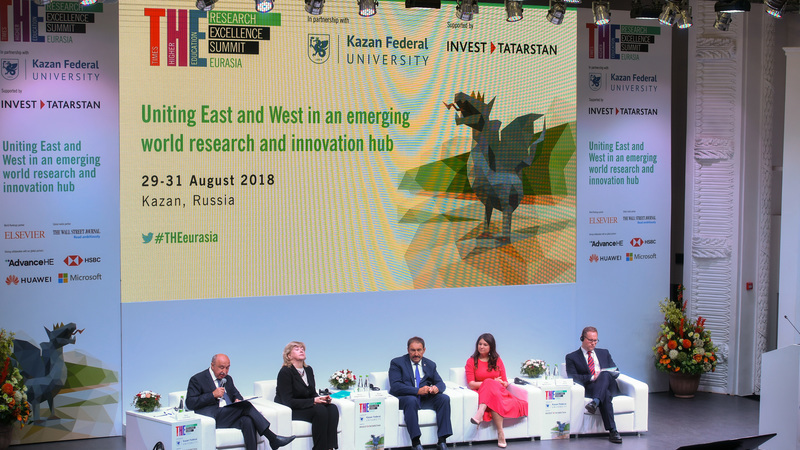 On 29–31 August 2018 the capital of the Republic of Tatarstan has hosted the first Research Excellence Summit: Eurasia 2018 run by the Times Higher Education (THE, https://www.timeshighereducation.com/), the world’s leading source of global data and intelligence on higher education, with more than five decades of dedicated experience. On 30 August in the Institute of Management, Economics and Finance of the Kazan Federal University has been held the official opening ceremony of the Summit, attended by Prime Minister of the Republic of Tatarstan Aleksey Pesoshin, Deputy Minister of Science and Higher Education of the Russian Federation Marina Borovskaya, Chief Executive of the Tatarstan Investment Development Agency Taliya Minullina, Rector of Kazan Federal University Ilshat Gafurov and Editorial director of global rankings of Times Higher Education Phil Bati. The Prime Minister of the Republic of Tatarstan noted that it is a great honor to represent the republic to the world scientific community. “Meetings with the representatives of the influential international institutions and companies are an excellent opportunity to get acquainted with and adopt experiences, share our own vision of prospects of development in the most actual issues in the sphere of science and economy”, stressed Alexey Pesoshin. Marina Borovskaya noted that Summit will help to understand the topical issues of modern science. “We will be able to determine the main emphasis that is important in organization of work of higher education, scientific space and scientific institutions”, pointed Deputy Minister of Science and Higher Education of the Russian Federation. The event was engaged by 270 experts and opinion leaders in higher education and research development, including representatives of specialised ministries, rectors and presidents of leading universities and their partners from a total of 20 countries worldwide, spanning Eurasia, North America and Australia, 27 Russian cities as well as 30 world-class speakers. “The Russian Federation is the largest country in the world in terms of territory. It is imbalanced in some ways, including in the sense of developing science and education. However, we have special points on the territory of our country that we can call as Hubs for the development of education and science. The Republic of Tatarstan is exactly such a Hub on the map of Russia. And we hope that we will be able to call ourselves like this on the world market”, noted Taliya Minullina, Chief Executive of TIDA. The Summit was featured the launch of THE’s first-ever ranking of the leading universities from all across the Eurasia region, comprising Afghanistan, Armenia, Azerbaijan, Belarus, Georgia, Iran, Kazakhstan, Kyrgyzstan, Mongolia, Moldova, Russia, Tajikistan, Turkey, Turkmenistan, Ukraine and Uzbekistan. Kazan Federal University took the tenth place in the rating of the best Eurasian universities. Moscow State University was ranked first, Moscow Institute of Physics and Technology took second place, and the Tomsk Polytechnic University came in third. "Now in Kazan, we announced the results of the new rating, and I see that Kazan and Tatarstan as a whole is a multicultural and very dynamically developing region, certainly ready to turn the points of growth in the economy and the existing advantages of the region into future strengths, attention to the implementation of research and innovation in the long term”, said Phil Bati. The main achievement of the Summit was making new contacts and projects. Indeed, all three days were full of meetings within the seminars indicated in the program, and during visits to museums, laboratories and excursions. "We are very grateful to the organizers of the programme for excellent round tables and expert discussions. Each such meeting makes you think about a new one. The exchange of experience that occurred here should be estimated and such trends that have been identified here should make us take a fresh look at our strategies", said Rector of the KFU Ilshat Gafurov. The Summit was organised by the Kazan Federal University and the Tatarstan Investment Development Agency in partnership with THE.